The The Broiler Restaurant is a Californian restaurant inside San Pablo Lytton Casino in San Pablo, California. Visited this place a few times. Machines are geared to take take take. Have never left ahead or broke even. It's a pretty miserable place as far as I am concerned. One star is to many. They have a restaurant what's really good food. I got New England clam chowder to go and it was only $4.99. Great deal and it was delicious! Pretty decent slot machines.. Hit 2 jackpots the same day and another the next day! Pretty good story, huh? Good luck!! Wonderful place to have a good time with family and friends! Great variety of food and drink choices. Also very courteous and friendly hostesses offering complimentary NON-alcoholic beverages and reasonably priced drink service. Be prepared to show I.D. between 8pm and 8am. The casino offers shuttle service upon request and at various stops throughout the parking lot. Handicapped parking fills quickly. Taxis frequent the entrance for our convenience as well. The AC transit 72 bus runs up and down the main strip of San Pablo Ave frequently with a short 5 hour break around midnight. Just a reminder there are no duffle bags allowed into the casino. A large purse is barely allowable. 😉 Ok... I don't recommend a large purse. Also, make sure to lock your vehicle and keep valuable belongings out of sight. 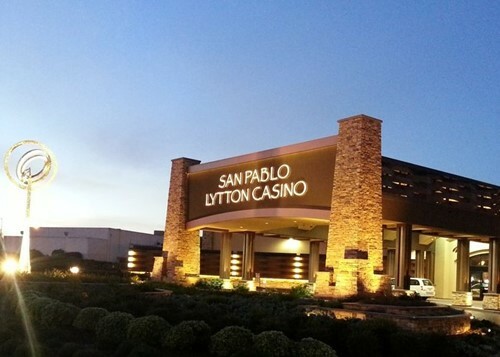 Enjoy your experience at San Pablo Casino and good luck! Loved the place. Went after midnight of my birthday, Thursday night, Friday morning & the place wasn't too crowded but not deserted either. Some of the machines club card slots weren't working & I wished they were because one of the machines that wasn't i was hitting on pretty good. I walked out up $ 700.00. I think the machines knew it was my birthday 😁😉, cause it seemed like almost any one i sat at was winning in some way or another. I usually leave my money there instead of taking some of theirs home with me. Great fun! Great restaurant. Bar is always good. Maybe you'll even get lucky. Or leave broke. Leave ATM card at home. Fun place all these years I lived in California I never knew this was here it's right in the middle of downtown. I had a nice little jackpot while I was there and the restaurants aren't bad. If you want a quick little getaway and some nice rub this is the place. I've never had more fun losing my money I can't wait to go back and hopefully win money, but if I lose again I'm sure it will be just as much fun as the last time. Service is prompt and matter where you sit you will not be forgotten. Servers are friendly and accommodating, floor staff and security are friendly and respectful and unobtrusive. All in all it delivers just what I want it to every time.